Bears-Buccaneers Recap: Nice Game Mitchell Trubisky. Nice Game. The Chicago Bears have had one of the better defenses in the NFL this season. But could Khalil Mack and company put a damper on the Fitz-magic? Or would Ryan Fitzpatrick have another 400-yard passing day? The journeyman quarterback has been destroying defenses this season. Could he destroy one more before handing the ball back over to Jameis Winston? Did he have any magic left? There was magic on the field, but it didn’t belong to Fitzpatrick this time. It was all Mitchell Trubisky’s. The second-year quarterback had a career day against the porous Tampa Bay defense. He completed 19 of 26 passes for 354 yards and six touchdowns. 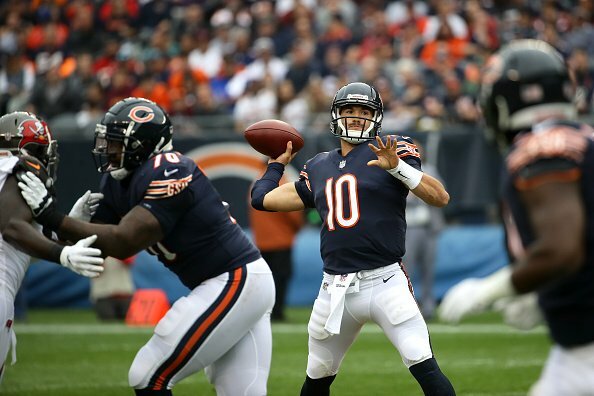 “Hopefully, this will be something I can look back on and say, ‘This is where it all started,’” Trubisky said after the game. He entered the game having never thrown more than two touchdown passes in a single game before. But he had two in the first quarter alone and five before the end of the first half. The sixth came early in the third quarter. Trubisky got plenty of help from his defense who kept Fitzpatrick from conjuring any magic in the first half. After completing just nine of 18 passes for 126 yards and an interception, Fitzpatrick was benched in the second half for Jameis Winston. He didn’t fare much better (16-20 for 145 yards, one touchdown, and two interceptions). Trubisky’s six touchdown performance set a new franchise mark and fell just one short of his rookie season total (seven). The win puts the Bears on top of the NFC North with a record of 3-1. But the Bears have yet to play anyone inside the division other than the home opener against Green Bay Green Bay—a game they should have won. Minnesota has played well despite their record (1-2-1). The Detroit Lions are better than their record indicates as well (1-3). So, if they can continue to play at the level they showed Sunday, it will not be easy to win the division. Tampa Bay falls to 2-2 and is now in third in the NFC South. It will be interesting to see if they go with Fitzpatrick again or if they give the reigns of the offense back over to Winston. Trubisky and the Bears will try to keep the good times rolling when the head to Miami next week to take on the Dolphins. The Buccaneers will try to right the ship with a trip to Atlanta to take on the Falcons.